Not everyone drives to work, takes the train, rides the bus, or rides a bike. 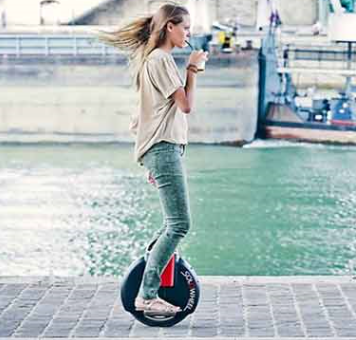 Some people commute in an entirely new, innovative, way using a variety of methods including self-balancing scooters, electric wheels, and electric unicycles, and portable motors. Why? It’s both fun and economical. This new generation of electric transportation methods solves problems with getting around in dense urban areas in an economical way. Instead of needing a car or motorcycle, these personal devices take up little room and are efficient and entertaining. Commute to school on a self-balancing electric wheel. Or, add a portable motor to a bicycle or scooter to get around town quickly. With lights, horns, and Bluetooth integration, the future of electric-powered transportation is hip and eye-catching. Poll students. Have they ridden or seen any of these devices? What were their experiences? Divide students into teams. Have each team determine a target market for the products. Once a target market is selected, have each team develop the marketing mix. Share the plans on the white board. Debrief the exercise.